It all began with her…. 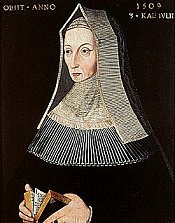 Margaret Beaufort, mother of Henry Tudor and descendant of King Edward III. Her descent was actually illegitimate, through Edward III’s son, John of Gaunt and his mistress Catherine Swynford. Though Gaunt later married Swynford and an act of government legitimized their children, they were expressly forbidden to inherit the throne by Gaunt’s legitimate son, King Henry IV. Margaret bore her only child, who became King Henry VII, at the age of thirteen. While the York and Lancaster branches of the royal family battled for the throne, her husband died and her brother-in-law fled to Brittany with the young Henry. His long exile ended on 15 August 1485 when King Richard III was defeated at Bosworth Field. The Plantagenet dynasty, having ruled England since 1154, ended in strife and the Tudor dynasty began. Click here to view a .bmp (bitmap) image of a Tudor family tree. I apologize for the blurry text; I’m searching out a better scan. Below is a more detailed text genealogy. Lady Dorothea Stewart, born ? Go to the Scottish genealogy page. Go to the Stafford/Blount/Fitzroy genealogy page.